A major rebel group in Darfur has let 60 prisoners go, says the International Committee of the Red Cross (ICRC). Fifty-five of the prisoners were from the armed forces while the other five were from the police, the ICRC said. They were released by the Justice and Equality Movement (Jem) to the ICRC, and then handed over to the Sudanese authorities in Kutum, in North Darfur. The handover is one of the biggest since the bitter conflict in Darfur began in 2003. A spokesman for the group said most of the prisoners were taken in clashes between Jem troops and government forces in the north-east of Darfur earlier this year. The spokesman said his movement had decided to release the men as a gesture of goodwill. He said Jem still holds lots of prisoners, but refused to say how many. The Sudanese government was not immediately available for comment. 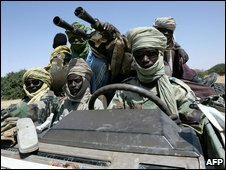 Jem is one of the biggest of the many rebel groups fighting in Darfur, several of which are negotiating with the government. Another armed group is holding two workers from a non-governmental organisation. The Sudanese government says it is working for their release. As many as 300,000 people have died during the conflict in Darfur, according to the UN. Khartoum disputes the figure, saying only 10,000 people have lost their lives.